In addition to seeing what it's all about and enjoying the activities, I went to GenCon Indianapolis with one objective: to find out what the deal is with Wizards of the Coast and Gamma World. After four days, I wish I had a answer. I mean, I wasn't expecting a resolution of this whole thing, but it would have been nice to have any information. You would think that a gaming convention would be the sort of place to get business-like, mingling with the representatives of all the companies there in the hopes of making your own business successful. I have no doubt that many accomplished that, but if they did I don't imagine it was done easily with Wizards of the Coast. Even though they were a major sponsor of the whole event, besides the Atari folks showing off the video games there weren't any "branding" people at the WotC booth in the dealer hall. I imagine they were all, for the most part, at the Indiana Ballroom instead, which is somewhat inconvenient in that it's distant from the convention itself; if I were to hang around the Indiana room all the time and try to speak to someone there I would pretty much miss the entire convention. And I didn't want to be "that guy" that stalked WotC employees, insisting on talking about Gamma World at extremely inappropriate times. I wasn't going to bring up the topic when I saw staff at Steak & Shake, or jump in to a group of a dozen WotC employees standing around in the Westin lobby, 'cause that would be kind of rude. The only thing I was able to accomplish on this front is speaking out at the R&D session on Thursday, where I brought up the issue of the recent Rule of Three article stating that there was no planned Gamma World content for digital release. Their response, put simply, was that saying "we don't have any Gamma World content planned" isn't the same thing as "Gamma World is dead." They suggested that Gamma World is not dead. In the product preview seminar on Saturday, the topic of Gamma World never came up at all. Beyond those venues, Wizards of the Coast seems to pretend that Gamma World didn't exist, but there were signs of life. First off, one of the tables at the "Drunken D&D" event on Wednesday night was Gamma World themed and manned by WotC staff (such as Michael Robles). Secondly, they seem to be giving out Gamma World boxes like candy: there was a pile of boxes shoulder high for the judges to take in the Sagamore room, and each winner of the D&D Open took a Gamma World box as a prize. In afterthought, there is the possibility that they are giving these boxes away so eagerly just to get rid of their inventory, but I'd rather not think of it that way. I understand that, as a company, Wizards of the Coast has to follow the path that makes the most sense from a business standpoint, so all the products that will make them more money get top billing. And I understand that since Gamma World isn't one of their moneymakers it gets pushed aside. What does bother me is that there are those of us out here that want to pick up the reins and do with it what Wizards of the Coast doesn't have the time or inclination to do, but we are restricted from doing that by their legal department. They're not actively trying to kill Gamma World; it will wither away and die on its own due to lack of attention. So I'm not giving up. As soon as I was back home and able to clear most of the cobwebs from my mind, I fired off another volley of messages to Wizards of the Coast legal. 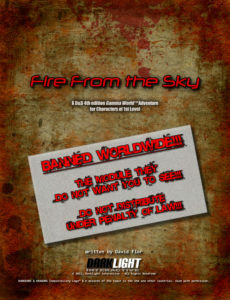 Also, in response to a Twitter post by Steve Winter commenting on PDFs from the "small press market", I got his contact information and sent him links to Fire From the Sky and The Coming Dark, Chapter One: Into the Light. Hopefully, sooner or later, I'll have a clearer picture of what I can and cannot do. Until then, I will continue to develop my three modules - The Fortress of Dr. Neb will get done, even if I'm the only person who will ever see it - and otherwise be known as "the guy that got hit with the C&D". I can live with that, I guess. Soon I'll write up a separate post regarding the GenCon experience, but there are still a few lingering cobwebs in my skull so I'm not quite ready to do that.